Here is a picture of La Gonave. The former President Michel Martelly had made a plan with an unknown institution to transform the La Gonâve Island into an International Financial Center with three official languages: English, French and Creole. 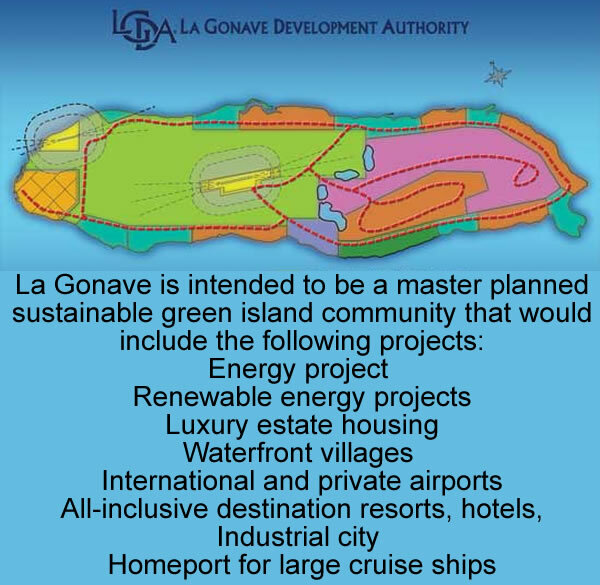 As per the plan, an area of 100 square kilometers within the 743 square kilometer Island of Gonâve will be transformed into a sustainable green island community consisting the following projects. (a) renewable energy project, Jatropha farm and biodiesel plant that would employ over 18,000 Haitians; (b) luxury estate housing; (c) waterfront villages; (d) international and private airports; (e) industrial city with deep sea port; (f) all inclusive destination resorts with spas, golf courses and casinos; and (g) home port for large cruise ships. The agreement withholding the description of financial institution was made public by an Executive order issued by the Martelly government on January 7, 2016. The private entity will be empowered to build necessary infrastructure as per the requirement of the project and collect revenue to cover their investment. The plan was originally conceptualized in September 2010. It was a surprising fact that a public disclosure of such status was unknown outside of the principles involved.